Vehicular combat games have been around for quite some time. 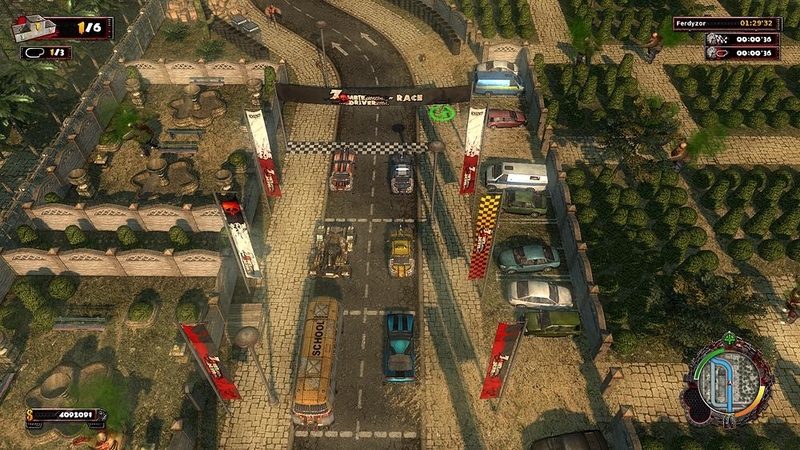 Developers have excelled at giving gamers the ability to maneuver a wide variety of vehicles in games entirely focused on combat with racing taking a backseat. EXOR Studios was not content leaving this void unfilled. 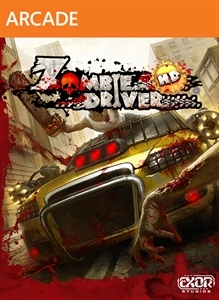 The name of the game could be interpreted as a misnomer due to the fact that a zombie is not driving the car. 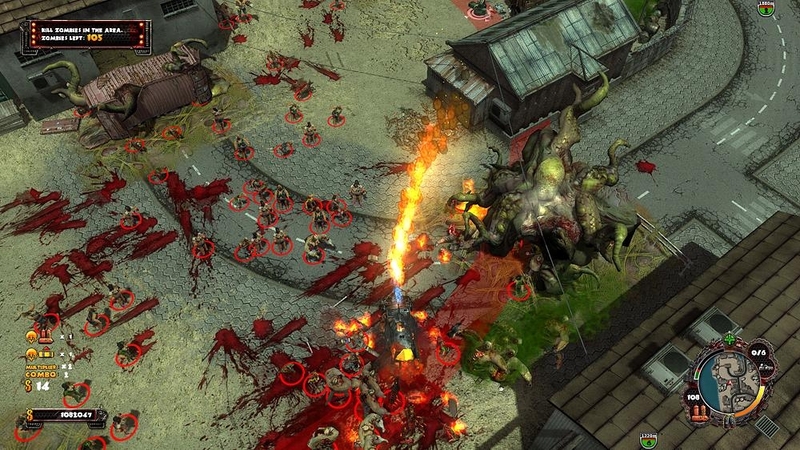 This ¾ view racer’s priorities are blood, zombies and explosions so it really doesn’t matter. Aaron: ZDHD checks all of the appropriate boxes including a campaign, several variations of competitive racing and a survival mode. The campaign is primarily focused on missions where you need to rescue a certain number of people such as students at a school, engineers or a reporter from a location on the map that is overrun with the walking dead. From what I’ve played the “motivation” is all that changes as the game mechanics are exactly the same. 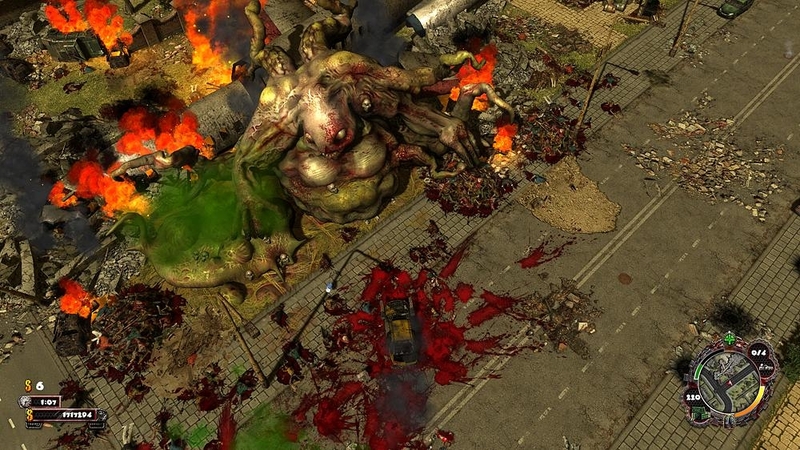 The player is asked to eliminate all(sometimes most) of the enemies from an area designated on the map. Once that occurs the people in peril run out and enter the vehicle. Depending on the vehicle type you may be able to earn more money, cars etc by tackling secondary missions. That can happen if your conveyance can fit more people in it or you have to drop off the recently rescued at the inexplicably secure base before continuing. This can wear a little thin sooner than later though. There are some boss creatures to defeat so that can break up some of the monotony. BigRob: ZDHD lacks direction, but they make up for it in spades with sheer variety of content. The main campaign is interesting, but the boring voice-overs and repetitive mission style will likely leave players wanting more. The alternative modes outside of the campaign are where this game truly takes shape and shows that it really isn’t…. undead. Aaron: The competitive racing mode called Blood Race offers up some quick lap based races with events that attempt to mix things up a bit. The AI racers frequently would drive off of the road, convincing me to do the same with less than stellar results. I hit walls that looked very similar to fences and gates that I had been crashing through with ease. The events are nothing particularly new and consist of elimination, traditional racing and endurance. If you’ve played a handful or racing games in the past 15 years you will easily recognize what these game types are about. Elimination rewards you for destroying the most cars, racing rewards placement and endurance is all about getting to the checkpoints. BigRob: The racing modes bring such a stark contrast to the campaign that I wonder if the two halves were just bolted together by two different development teams. Now, its not ground breaking and wildly different from other old school top down racers (e.g. RC Pro AM, Micro Machines), but it does seem to show a lot more imagination and creativity than on the campaign side. There are point based racing tournaments to enter that consist of 4 to 5 different race types per tournament. Winning tournaments will then unlock the ability to play single races in the mode of your choice. I did have some issues with the camera that were compounded by the horrible map system in the campaign mode. The racing modes do away with all of that and they clearly define the tracks with borders and a loose outline of where racers should go. Funny how the game became 100% more playable when you could easily tell on-screen where you were supposed to be going. You race to win; shoot your competition to slow them down. You shoot your opponents to win; racing them is just a formality. You race to stay alive; oh yeah, we have zombies to shoot too and if you don’t stay above 50mph your car explodes. (Or something like that, I stopped paying attention.) These modes are pretty solid, though the AI will opt to “Off-Road it” more often than not… its almost unfair except once you get used to the weird handling model you can usually blow past the other racers when you stick to the basic racing lines of the course. Aaron: Driving in a small section of one of the larger maps for as long as possible with reappearing power-ups is survival mode in a nutshell. Of course there are leader boards for that mode and every mode as are earning money and customizing your cars. Weapons like the machine gun, rail gun, flame thrower missiles can be upgraded and benefit every car you have. However customizing the speed, ramming ability and armor are upgrades applied per car. BigRob: They skimp on the weapons and upgrade departments but I like that they kept it simple. Since you have to dump cash into upgrades it would’ve been nice if you could dictate what upgrades you get on the courses, or if they were a little bit more balanced…. maybe I’m asking too much. 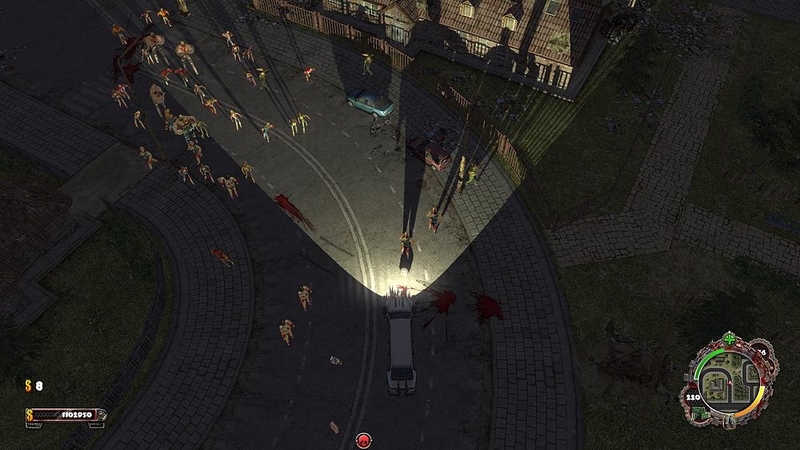 I suppose flamethrowers work equally well against zombies and AI cars. It also appears that flamethrowers don’t work online!! Where is the multiplayer?! The one half of the game that is pretty good doesn’t feature an online mode? Oh well, at least I can paint my cars red. Aaron: Driving and shooting through crowds of zombies was enjoyable for about an hour or so. I found that the blood race mode’s variants were the most enjoyable. That enjoyment was hampered a bit by some of the less than stellar control in addition to me getting stuck on other cars and corners of some buildings. Blowing up cars around you, when the controls allow you to hit them, always felt good. Initially I felt inclined to try the campaign mode first but the basic and repetitive nature of drive-shoot-rescue-drop-off gameplay got old quick. The game is not horrible but it doesn’t do anything particularly well. There is fun to be had but in very small doses. BigRob: For a game with so many bright spots and great ideas its unfortunate that it was saddled with just as many knocks against it. Poor handling cars coupled with a wonky camera, and a soggy campaign are all annoying cons to what is a potentially great concept. Most of these issues could’ve been redeemed or overlooked had there been a tight multiplayer mode included. Even still, some of these could be patched so I remain hopeful but overall just a bit disappointed. Full Disclosure: GameEnthus received this game from EXOR studios and we played the game for several hours each. 2nd Level reviews are reviews written and released despite the full game(campaign) having not been completed. – Where is the multiplayer online racing? Previous Post:GameEnthus Podcast: Wii U Rebel or How Many Iwatas?